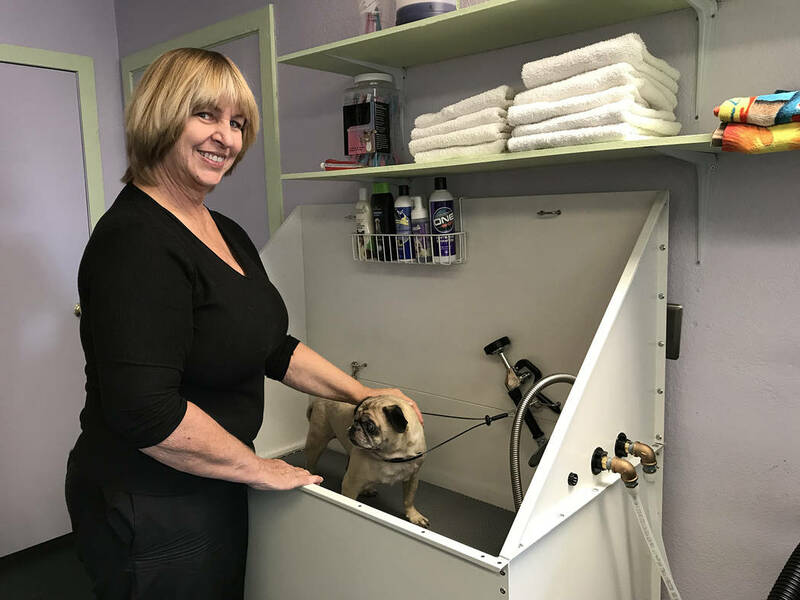 After falling in love with the community, Janette Housley decided to put some roots down and planted her mobile pet grooming business on Boulder City Parkway. (Hali Bernstein Saylor/Boulder City Review) Janette Housley demonstrates bathing techniques with her pug Pogie at her new grooming business, The Doggie Stylist at 1402 Boulder City Parkway, Suite B. 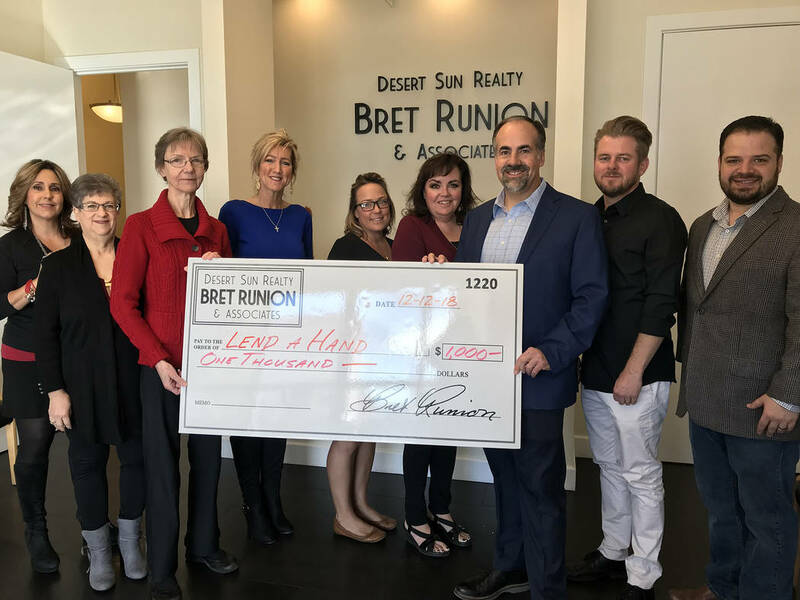 (Hali Bernstein Saylor/Boulder City Review) Realtors at Desert Sun Realty donate a portion of each completed transaction to a special fund to benefit community organizations, including Lend A Hand of Boulder City, which was given a $1,000 donation Thursday, Dec. 13, 2018. Pictured are, from left, Anna Marie Argenia, Cherry Aton, Lettie Zimmerman of Lend A Hand, Amber Bartholomew, Mendy Wanigaskera, Shana Rudd, Bret Runion, John Calvert and Nate Lasoff. Housley has 25 years of experience as a pet groomer, specializing in dogs of all sizes and cats. If pets are clean and in happy homes, they’re not in shelters, she said. She started working with animals as a volunteer at a shelter and spent about two years making them look nice and getting healthy before she realized she could turn her skills into a career. Hailing from Aspen, Colorado, Housley had a mobile business for 15 years before choosing to establish a permanent location. She said she has visited numerous cities throughout the Southwest, first stopping in Boulder City about 30 years ago when she was a snowbird, and was impressed by its small-town and green oasis feel on a recent visit. Not only has she worked with common domestic animals, she has groomed a pet fox, shaved a llama and spent time with rabbits, birds and reptiles. Her fees depend on the type of service selected and size of the animal, with a bath for a small dog starting at $25 and a bath for a large dog starting at $65. Baths for cats start at $30 and a standard shave starts at $60. The Doggie Stylist is at 1402 B Boulder City Parkway. For more information, call Housley at 702-539-6481. Longtime bowler and Las Vegas native Jennifer Mauri purchased Boulder Bowl at 504 California Ave., in September. Since purchasing the property, Mauri said she is working on adding events and specials to the facility. It is now open on Fridays and Saturdays until midnight. “I want to give teens … and adults more to do,” she said. Additionally, she’s added cosmic bowling and Sunday specials. On Sundays, there is an the early bird special from 9 a.m. to noon with games at $1.75 per person, plus a free cup of coffee, and a family special from 5-9 p.m. at $8 each a person for two games, shoe rental, a fountain drink and a bag of chips. Mauri also will give Boulder City residents a gift on Sunday, Jan. 6: two free games between 9 a.m. and 8 p.m. The new owner of the Desert Inn Motel, 800 Nevada Way, intends to renovate the property and return it to more of a nightly stay place. The 27-room facility is now owned by BCMI LLC. Recently, Choing Jon Sang, sole proprietor of BCMI, requested and received a $17,130 grant from the city’s Redevelopment Agency for property improvements including the parking lot, window replacement, landscaping and painting. Sang is planning a $360,000 renovation of the property. GNC, a vitamin and supplement store at 1012 Nevada Way, Suite 1012, is closing. Its last date could not be confirmed by the corporate office after numerous calls went unanswered. The store has a sign posted that states it is moving and encouraged people to visit locations in Henderson at 25 E. Horizon Ridge Parkway, 334 W. Lake Mead Parkway, Suite 110 Building 8, and 1300 W. Sunset Road, Suite 2409. Realtors at Desert Sun Realty devote a portion of each closing transaction to a special fund that is donated to various organizations in town. In December, they donated $1,000 each to Emergency Aid of Boulder City and Lend A Hand of Boulder City. Bret Runion, owner of the company, said they have supported local sports teams, schools and the parks and recreation department. They also want to highlight the efforts of groups that provide services, such as Emergency Aid and Lend A Hand. “We’re proud of our local support,” he said. Thirteen Realtors at the company contribute to the fund. Fans of the game that has you covering numbered and lettered spots in order to shout “bingo” have a new place to play. Hoover Dam Lodge, 18000 U.S. Highway 93, has created a bingo hall on the second floor just off the main casino floor. The 3,200-square-foot space has rooms designated for smokers and nonsmokers. Seven sessions are offered daily on the odd hours from 9 a.m. to 9 p.m.
For details, visit http://www.hooverdamlodge.com or call 800-245-6380. In November, Best Dam Vapor moved to 1404 Boulder City Parkway, Suite A, and changed its name to Ready Hemp Co. The store sells hemp-derived and cannabidiol (CBD) products as well as its vapor products.